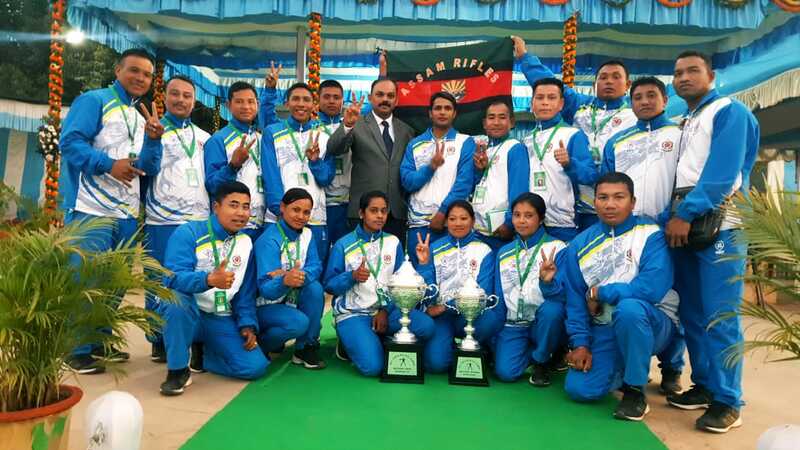 The Assam Rifles Archery Team from Manipur secured overall second position in the seventh All India Police Archery Championship which was held at Ranchi in Jharkhand from January 15 to 17, 2019, according to a press release. The team also received the trophies for runners up in men’s category and second runners up in the women’s category. The Assam Rifles team comprising 12 men and six women archers took part in the Indian, Recurve and Compound events of Men and Women categories and bagged a of total of eight gold, four silver and three bronze medals . “This is the first time that Assam Rifles achieved a podium finish in this event and narrowly missed the winner’s trophy even though they had the same tally in gold and silver medals as the winner team of Border Security Force (BSF),” stated the Assam Rifles (South) PRO in a press release in Imphal. A total of 22 teams from the Central Armed Police Forces and State Police Forces participated in the competition. The Men’s team of Assam Rifles won gold medal and the mixed team of Rifleman Zhokhoto Demo and Mahila Rifleman S P Lidiya won silver medal, both in the Indian round. Apart from the medals won by the archers in the team event individual medals were also won wherein Rifleman G Robert Singh won individual two gold, one silver and one bronze in Compound round, Rifleman Demo won individual two gold, one silver and one bronze in Indian round, Rifleman N Subhachandra Meetei won individual one silver in Recurve round, Rifleman P Heroba Singh won one bronze in Indian round and Mahila Rifleman Lidiya won three gold in Indian round. Lecture on lifestyle and infectious diseases: Meanwhile, in another development, the Mantripukhri Battalion of 9 Sector Assam Rifles organized a lecture on lifestyle and infectious diseases for the villagers of Kameng at the Kameng Community Hall on January 21. The lecture which was organized by Chingmeirong Company Operating Base focused on the importance of health in modern lifestyle era along with discussion on obesity, diabetes and various heart related diseases including their related preventive measures. The attendees took a keen interest in understanding the lifestyle leading to such diseases and actively participated in the interactive session conducted over the topic.